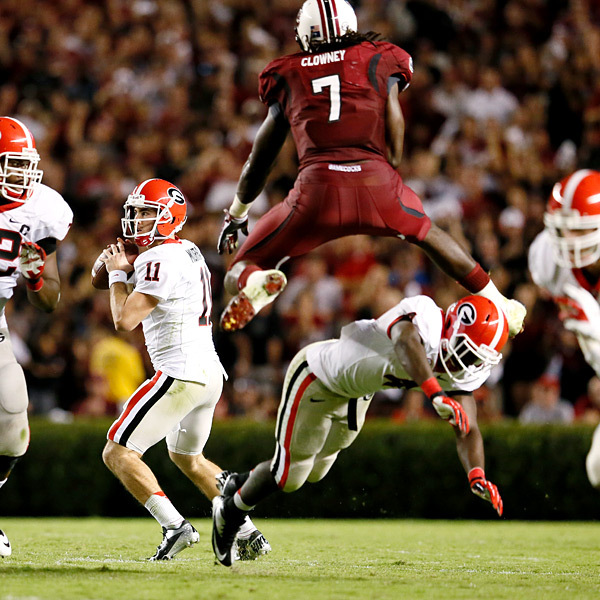 Without a doubt, the most talented player available for the 2014 NFL draft is Jadeveon Clowney. He is a freakish athlete. The 6’6” 266 pound defensive end ran a 4.53 40 yard dash at the NFL Combine. He also vertical jump 37.5” and broad jumped 10’ 4”. His combination of speed, quickness and strength are rare. If you want to see Clowney at his best, just put on the 2013 Outback Bowl tape against Michigan and witness the hit he put on Wolverine running back Vincent Smith. The problem with Clowney is that his best year was his sophomore year. For the entire 2013 season rumors swirled that Clowney was taking it easy, trying not to get hurt. Even South Carolina head coach Steve Spurrier didn’t help matters by publicly calling out his star player for his practice habits. When your head coach says your work ethic is “OK”, the red flags come out for me. The Houston Texans have the #1 overall draft pick. They desperately need a quarterback. It’s looking more and more that they will draft a QB, but not with the top overall pick. So now, what do they do? Ever since “the hit”, draft experts have touted him as the top prospect for this years’ draft. The prospect of a motivated Clowney paired with another freakish athlete in J.J. Watt could be special. New defensive coordinator Romeo Crennel could possibly use Clowney similar to the way he used Willie McGinest in the past. He could move him around, take advantage of matchups and unleash him on opposing offenses. I doubt Crennel would have him dropping much into coverage, but would likely take advantage of his natural pass rushing ability. The opposition would have to concentrate on Watt, simply because he is a former Defensive Player of the Year. That would free up Clowney to roam around and make plays. Clowney looks a little bit stiff to be a traditional outside linebacker, but if he were allowed to concentrate on just rushing the passer, he could put up some huge numbers. All of this boils down to the initial question. Will he put in the time and effort to become great? An unnamed NFC executive last week was quoted as saying Clowney is “spoiled, lazy and never worked a day in his life”. He also questioned how someone like that would react to being given a dump truck full of money. I have to admit that’s my concern also. Call it my Sonny Weaver Jr. gut feeling, but I have a hard time believing that a player with a questionable motor will become more motivated once they are paid big bucks. The only saving grace is the environment that Clowney would be put into. Watt is probably the hardest working athlete in the NFL and his motor is off the charts. Defensive line coach Bill Kollar is known for being extremely vocal and no-nonsense. The Texans linebacker coach is former Patriot linebacker Mike Vrabel who was also known for his football IQ and work ethic. By putting Clowney into this environment, it’s entirely possible that it rubs off on him and he puts in the work required to be a great defensive player. I’m glad this isn’t my decision to make. If it were, I think I would have to go with my gut and pass on Clowney. To me, he seems too laid back both on and off the field. When he decides to turn it on, watch out, but when will he flip that switch? Hopefully, if the Texans decide to go this way they will be able to keep him motivated. If not, he could become another Albert Haynesworth, just playing to get the big check. This entry was posted on April 22, 2014 by draftmaniacs in Draft profiles and tagged 2014 NFL draft, Jadeveon Clowney, NFL, NFL Draft.